The board that ignited the powder board revolution is back. For 2010, they’re taking the key features of the 2009 Fish and combining it with the premium options found on the Fish LTD. The result is an incredibly maneuverable board with a very stable yet surfy feel. Because of the board’s shape, Burton recommends you actually downsize 3-6 cm when deciding what Fish is right for you. Fans of the board love the playful feel, though critics say that the board doesn’t give you the same ability to ‘carve’ on top of powder that you’d find in a larger backcountry ride. Our thoughts: I’m not going to hide it. I love the Fish. This board takes powder riding to a new level. Because of it’s maneuverability, you can access powder stashes that most riders never get to, letting you farm a storm long after others have gone back to groomers. It’s definitely a powder-specific board. You don’t want to cruise hard pack on this ride, but we’ve found that the short tail and surfy feel can be a ton of fun on packed powder days. If you’re looking for a more all-purpose stick with many aspects of the Fish, check out the Molalo or SuperModel. But if you want a no compromises powder board for your best days, the Fish will do you no wrong. 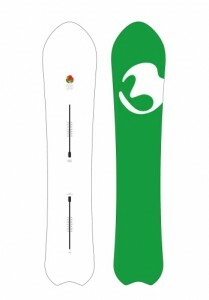 Camber: The board has Burton’s S-Rocker, which is designed to increase float and help keep the nose up by lifting the tip of the board when force is applied to the flex. Shape: The shape of the board has a 30 mm taper, the most in the Burton lineup, to help the tail to settling into the snow and the tip to keep from submarining. In case the pintail taper isn’t enough, they’ve given the board a subtle swallow-tail to decrease the surface area of the board’s rear. The result: no more rear leg burn.